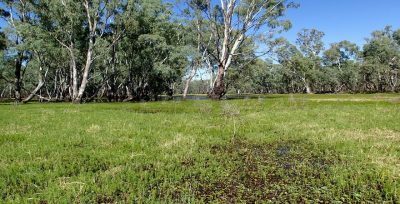 Environmental water plays an important role in creating and maintaining a sustainable river system within the Murray–Darling Basin, but what is environmental water and what does it achieve? Environmental water is water used to achieve environmental outcomes within the Basin. These outcomes include benefits to ecosystem functions, biodiversity, water quality and water resource health. Essentially, it is water that is allocated to the environment and isn’t available for extraction. So where does this water come from? The Australian Government is investing more than $5 billion in water savings infrastructure and on-farm efficiency projects. A capped amount of 1,500 GL of water is being purchased from willing sellers in the water market. Together, the water saved and purchased is building the Australian Government’s portfolio of environmental water. Some Basin states, The Living Murray program and other smaller programs also have their own holdings. The reason environmental water has become a priority within the Murray–Darling Basin is because, in recent decades, the MDBA has seen the health of the Basin affected by the combined impacts of droughts and over-use of water resources. Young Red Gum establishing on Little Rushy Swamp. Photo by Keith Ward. a reduction in floodplain inundation. Achieving a healthy working Basin means carefully balancing the needs of people — healthy farms and communities dependent on water — with the need to restore and maintain the health of the environment. 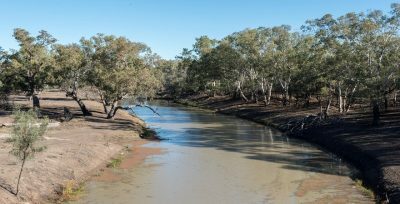 To determine the broad Basin-wide environmental outcomes to be achieved from the careful use of environmental water, the MDBA has established the Basin-wide environmental watering strategy. The MDBA has also helped inform environmental water managers, such as the Commonwealth Environmental Water Office, on how environmental water should be used each year through the annual environmental watering outlook and the annual environmental watering priorities. These outline watering opportunities for the year ahead and determine what the environmental watering priorities should be for the next 12 months. For instance, in dry conditions when water allocations are low, there is not a lot of water available on environmental entitlements to deliver to the environment, which limits what can be done with the small amount that is available. But delivering environmental water can make a difference — helping rivers, floodplains and wetlands maintain their basic functions, which benefits the whole Basin community. For example, environmental water can be used to maintain habitat for waterbirds, so that in wetter conditions their environment is in good condition to support breeding events. Healthy ecosystems help us — they contribute to cleaner air and water, play a role in nutrient cycling, provide places for cultural and recreational activities, and support fisheries and tourism. To support people and industries transition to a likely drier future, the Australian Government is investing in water savings infrastructure and on-farm efficiency projects. With the water saved, together with environmental water that has been purchased by governments, a portfolio of water is being set aside to be used to restore the health of the Basin’s important ecosystems. Namoi River, Walgett. Photo by Irene Dowdy.